Twilight deepens across this quiet landscape. Snow has fallen, blanketing everything in soft shapes and rounded poses. I turn, slowly, gently so as not to mar this perfect place. So silent, so still and I realize now that I am dressed in thin veils and snow colored garments. They glow and catch in this tender twilight, in shades of purple, pink and delicate orange. I have grown back into a child's form and find a holly wreath upon my head and tiny sparkling lights woven into my hair. 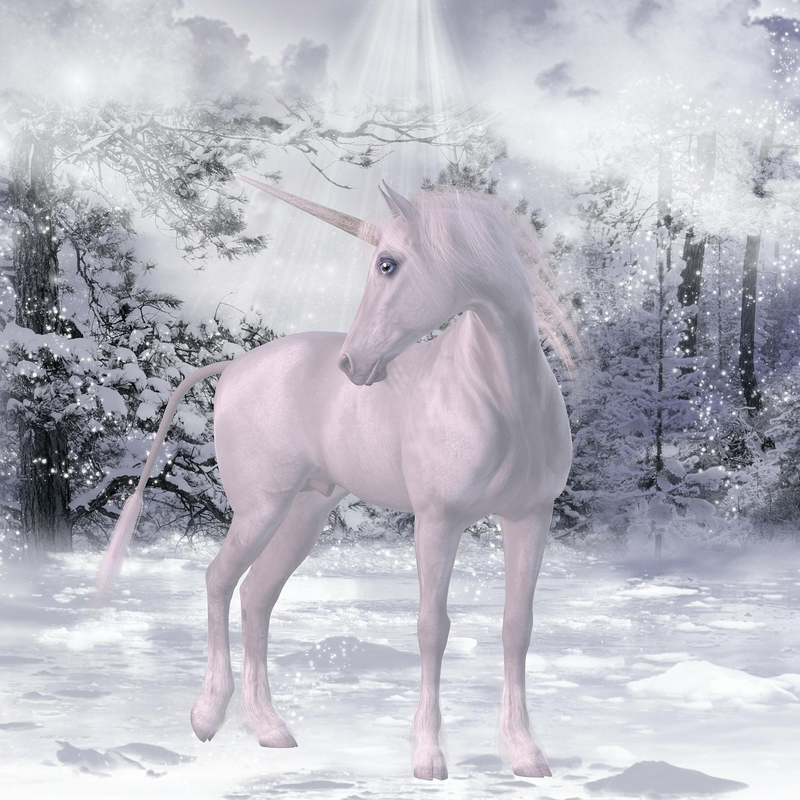 A unicorn comes towards me now, this most magical of creatures. And I reach for her as she bows her head slowly. She is of the creamiest white and a gold horn between her ears. She lowers her head towards me and I touch the tip of her horn and am transported, to find myself riding upon her smooth, warm back. She moves without a sound; she moves without affecting the snow. I watch the twilight deepen and first stars begin to twinkle in the deep purple sky. The world takes on this magical hue, deep lavender snow, soft shapes and darkened trees. I feel as if I am floating, riding like this on a most magical creature. The suns rays have faded almost entirely, and in the Eastern sky, the moon rises, a crescent, fair of form and curve. Her faint silver light seems to enchant this vision further and I find myself filled with wonder and delight. And now we come upon a splendid scene: a circle of trees, merrily decorated with twinkling tiny lights, and in the center of this grove, a long white table filled with colorful food and intricate dishes and festooned with evergreen garlands and bright red bows. Graceful and dancing candle flames are placed along the entire length. At the edges of the grove, two Yule logs burn brightly, their flames crackling and filling the circle with warmth and light. 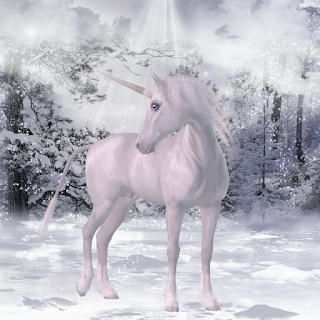 I slide off of the unicorn as she reaches back to nuzzle my arm. Her breath is warm in this cold air. I realize that even though I am dressed in the lightest of garments, I don't feel cold. The air is crisp and full of the scent of pine and bayberry. I breath deeply and step with mystery into this enchanted place. Sparkling lights and glowing candles greet my gaze and I smile softly. The food is delicate but rich. Tiny tarts and chocolate cakes, dishes made from fruits and sauces all adorn the spread. I wonder at the tiny size of all I see, but still the intricacy and charm. I feel beguiled with a place so magical and extraordinary in the middle of this snowy place. My eyes catch at movement to my right and my eyes are drawn slightly below my own height. A gnome moves with surprising gait for someone more portly and dressed so heavily. He nods to me and continues round the table to find a place and there he sits. He has begun a procession of bewitching woodland creatures: fairies and nymphs, dryads and tiny forest creatures file in to find their place at this magical feast. Each regards me with a twinkle in their eye as if they have some great secret. And I watch, feeling shy and yet honored to be graced this vision. The gnome gestures for me to sit at the table, and I take a place, albeit somewhat self consciously. But then each creature in turn rises to give me a small present. I am touched by their kindness and willingness to include me in this festive gathering. One gives me a blade of the greenest grass, alive still in this winter scape. Another still gives me a pinecone and still others, tiny morsels of the finest sweets. Then there are other gifts, that seem more mystical and magical by turn: a clock that I can bend and fold over on itself, a horn when placed to the ear produces the most magical tinkling melodies, melodies that make me giggle; I am given a sparkling glass that shows the future and a cut crystal meant to bring clever dreams. And the final present thrills me most of all, a tiny silver made bell, crafted and hammered to shine and glimmer and when rung, the most pure and enchanting of sounds peels forth, a sound that is more felt than heard. I feel transported, these lovely things placed around me and before me. I murmur a soft whisper of gratitude and the feasting commences. Although the dishes are tiny, I find myself filled and satisfied. The sweets are like none I have ever tasted before, their texture and flavor filling me with heady senses and softened motions. I am caught, spellbound in this magical place. And then it is time for me to leave this beautiful gathering. I nod to the small creatures, the squirrels with their tufted chins, and the fairies with their colorful garbs and the rabbits with wise eyes and birds with their timorous chirping. I take tiny hands and paws and claws in mine. My hand tingles to feel these intricate connections. Each one nods or blesses me by turn and slowly I find that vision fading into the night. The stars sparkle like a thousand jewels set in velvet above my head and there my unicorn finds me, warmed by the gentle kindness of these blessed creatures. The longest night of the year is begun and I climb slowly upon her back, sleepy and satisfied, content to let my dreams carry me to first light.